Anna’s take: Bakersfield is an excellent option before or after a Colts game, or if you just want to experience a bit of the downtown Indianapolis atmosphere. 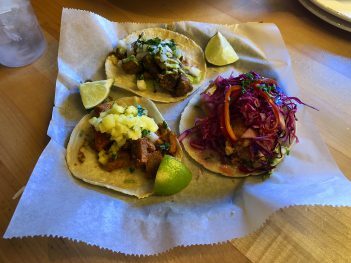 I ordered three tacos – an Al Pastor, a Pollo Asado and a Baja Shrimp. Each comes on a tortilla handmade in house and are al a carte. Bakersfield offers a variety of tacos, including carnitas, fish, cochinita pibil, hongos, huitlacoche and short rib. The Al Pastor is stuffed with chile-marinated pork, pickled white onion and topped with pineapple and cilantro. The Pollo Asado includes marinated grilled chicken, black beans, crunchy diced jicama, pickled white onion, tomatillo crema and is topped with cilantro. It is a milder option for those with an aversion to spicy foods. The Baja Shrimp taco comes with crispy, battered shrimp, chipotle lime crema, guacamole, red cabbage, pickled fresno peppers and chives. This definitely had a little bit more kick from the chipotle lime crema, so keep that in mind when ordering. My favorite thing about Bakersfield, besides the bustling city atmosphere, is the handmade tortillas. The tacos come with a lime wedge to squeeze for extra zest. Suggested pairings: Bakersfield is known for its margaritas, and nothing pairs better with tacos than a margarita. I ordered the Bakersfield Margarita ($9), which is crafted with El Jimador Blanco, triple sec, agave nectar, fresh lemons and limes and comes with a salted rim. Pitchers also are available for $34.